Today I have a little something for you which I've been meaning to review for absolutely ages. I'm always attracted to brightly coloured accessories because my clothes tend to me of darker shades, so I like to jazz up my outfit with touches of brights. 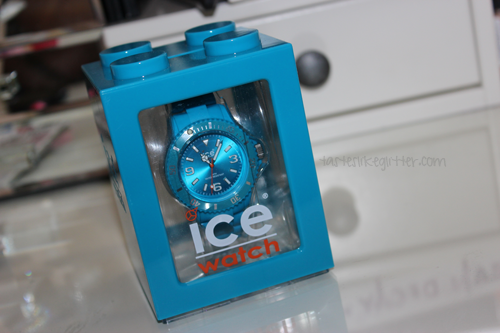 So when I got a chance to try the Classic Ice Watch in a bright blue, I couldn't resist - especially since it's my favourite colour. Firstly, I love the box it comes in. It's like a piece of Lego but it has a slot in the top to use as a piggy bank. I shall definitely be using this to save my pennies instead of leaving them all over the house. When I first got this I was super careful in making sure not to knock it as it's plastic I imagined it wouldn't be super robust. This only lasted for a week or so. It gets bashed around a fair bit at work but these photos were taken just yesterday and it's still looking perfectly new. I love this watch more than I originally thought I would. I find myself wearing this daily and keeping my Phosphor for those special occasions when you want a bit more sparkle, since this is more your everyday watch. It's completely different to the other watch I have - Phosphor Appear, the face is of a more classic and popular design. Which makes it easily readable. 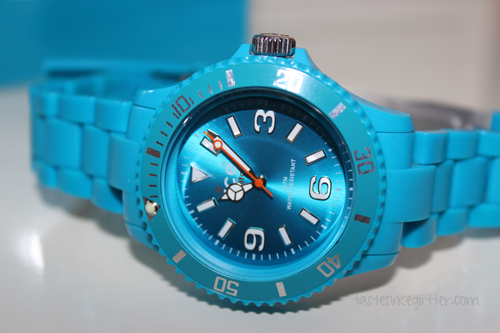 Whilst some people not be a fun of such a bright colour, Tic Watches are the UK's biggest Ice stockist. They carry everything from white to black and every shade in between. If you're looking for something a bit more quirky, they have many weird and wonderful watches. I've had my eye on this Kenneth Cole watch for a while now, one day it will be mine!